Can I be honest about something? I love putting my thoughts on paper. Revising or refining those thoughts- not so much. In fact, my parents would proofread my papers for me in high school, and I hated when they found errors in a paper that I thought was finished, but when I accepted their correction and made the changes it meant the difference between an okay assignment and a well-written one. This reminds me of Hebrews 12:11 , ” For the moment all discipline seems painful rather than pleasant, but later it yields the peaceful fruit of righteousness to those who have been trained by it.” There are many things in life that are not easy, but are worth the time and effort put into them. 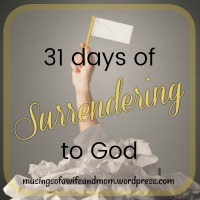 Surrendering to God and allowing Him to refine is not always easy or enjoyable, but it is worth it. The most comforting part is that God is with us every step of the way.